Disclaimer: I am not a dog trainer, nor am I certified in canine behavior. I’m sharing tips that have worked for my fearful dog, but that doesn’t mean they’re necessarily right for yours. Managing fear isn’t simple. If you have a fearful dog and need help I suggest seeking out a professional trainer in your area. One of the difficulties in answering the question is the question itself. Each of us imagines a different scenario when we picture our dogs being fearful, and each of us comforts our dogs in a different way. There’s so many variables in the question itself, there really isn’t a simple way to answer it. The short answer is yes, you can comfort a fearful dog without reinforcing their fear. Does that mean it’s going to solve the problem immediately and alleviate your dogs fear? No, and sometimes there’s going to be a better option than just providing comfort. When it comes to fear you need to be mindful of what would benefit your dog most in any given situation. Not such a simple question to answer, is it? Since I often see the same arguments on both sides regarding reinforcing a dogs fear I’d like to take a moment to clarify some of the confusion. Here’s 3 common misconceptions that surround the question of whether or not you should comfort a fearful dog. You get a ton of answers from both sides, and you’re probably feeling more confused and discouraged than you were to begin with. I mean it’s a simple question after all, yet everyone answers it differently. The first problem with the question of comforting a fearful dog is the fact that we’re not all on the same page when it comes to how we define comfort to begin with. Some think of petting as providing comfort, some think of using distraction techniques as comfort, and others imagine scooping your dog up like a baby and whispering “it’s all going to be OK” as comfort. Technically no one is wrong — each of those things may provide some level of comfort to your dog during something scary. But the real issue to keep in mind is knowing what would comfort your dog in that situation. Will a massage be enough to comfort your dog during that storm, will playing music be enough, or do you need to use a distraction technique such as using food? The best way to address whether or not you should comfort your dog during X event is to think about what would help them out in the long run. Is this a one time situation that probably won’t come up again? (such as an unknown dog charging towards you on a walk) If that’s the case sometimes the best way to provide comfort is to remove yourself from the situation. 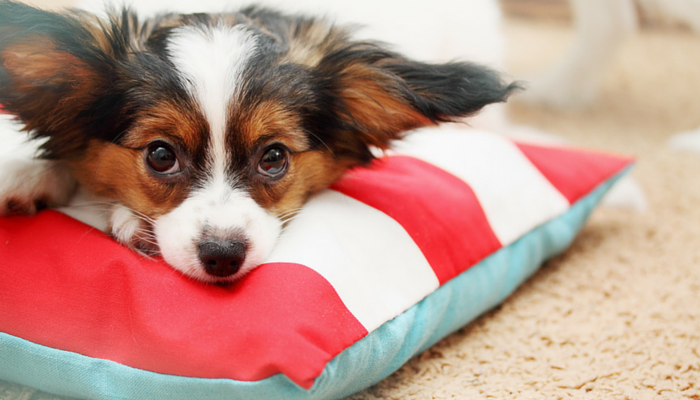 If it’s a scary situation that will come up again, such as fireworks or thunderstorms, you should be thinking of ways to help make your dog comfortable with it in the long run. If it’s thunderstorms try giving your a treat when you hear the boom of thunder. Eventually they will start to associate it as not being such a bad thing. That sort of comfort won’t reinforce your dog’s fears — if anything it will make them easier to manage. By making your dog more comfortable in a scary situation you’re helping them see that it’s not the worst thing in the world after all. Managing fear isn’t simple, and a stranger on the internet isn’t likely to provide you with the best answer when it comes to your dog. It’s about knowing your dog and what they find comforting, and knowing how to keep them from going over threshold and panicking. The way I’d comfort a dog whose nervous around strangers is a lot different than the way I’d comfort a dog panicking during fireworks. Levels of fear vary, and so do the levels of comfort we provide. The most common misconception when it comes to comforting a fearful dog is that it will just reinforce the fear. I certainly understand where this concern comes from, but it’s important to note the distinction between fear & behavior. Fear is the unpleasant emotion caused by the belief that something is dangerous. Behavior is the way in which one acts in response to a situation.When we talk about fear we’re only talking about the unpleasant feeling that we’re in danger, not the behaviors associated with it. We often get stuck in the mindset of thinking that providing comfort to a fearful dog is just reinforcing their fear, and that it’s just going to make the fear worse. Our emotions can effect our dog’s fear (more on that below), but comforting behaviors will not. Think of it this way; if your dog is terrified of thunderstorms & you pet them during one it’s not going to make their fear of storms worse. Petting during a storm may not be enough to prevent them from being fearful the next time, but it provides at least a little comfort in the meantime. Let’s say you’re afraid of the dentist so you ask your friend to come along for moral support. While you’re there she keeps you distracted by making small talk and telling jokes. In the end she provided you some comfort — she stayed calm and helped distract you from your own fear a little bit. That comfort she provided didn’t make your fear of the dentist worse — it helped make it a little more manageable. Now if your friend that you had asked to come along was afraid of the dentist as well you may have a problem. If she paced around and kept looking out the window while you were in the waiting room you’d pick up on it — and that could make your fear worse. Emotions can reinforce fear, but comforting behaviors don’t. 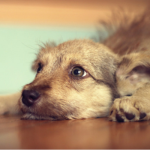 So when it comes to helping your dog with their fears keep your own emotional state in mind. As long as the comfort you’re providing is actually comforting to your dog (and done in a calm manner) you’re not going to be reinforcing their fear. Keep in mind that fear exists on a scale ranging from mild to severe. For dogs that are extremely fearful of a situation providing a little bit of comfort isn’t likely to solve the underlying issue, but it’s certainly not going to make it worse. In certain situations where our dogs get extremely fearful comforting them is the most humane thing to do, and if that’s not possible by simply petting them sometimes removing yourself from the situation is the best choice. It’s similar to the way we help our friends deal with scary stuff. If your friend is terrified of elevators you can try to help keep them calm by distracting them during the ride. Your comfort & support isn’t making their fear of elevators worse, but it may help make it easier for them to deal with. Now compare that with the method of just letting them just deal with it themselves by pushing them into the elevator & saying “haha sucker, have fun!” Perhaps they’ll have a quick moment of relief when that ride is over, but that’s assuming they don’t have a complete panic attack & shut down before that. You can make fear worse by forcing someone (or your dog) into a fear inducing situation without providing any kind of support. Providing comfort to a fearful dog won’t enforce their fear. When we choose not to provide our dogs with help & support in scary situations that fear can get much worse. 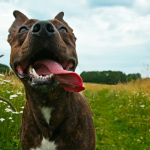 When it comes to helping a fearful dog it’s important to keep your own behaviors in mind. While you won’t reinforce fear by remaining calm & providing comfort to your dog, you can make things worse by being nervous yourself. If you yourself panic when you meet a new dog your dog will pick up on it. 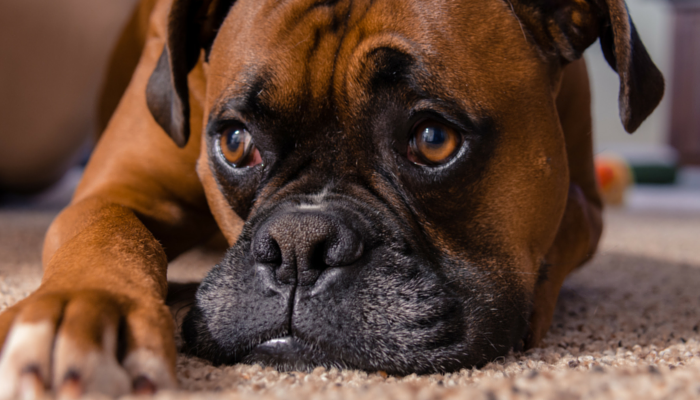 Your emotional state can effect your dog. If you’re scooping your dog up every time they meet a new dog they may start to assume that “hey there is something to be scared of,” and they may begin to act more defensively when a new dog approaches. For long term solutions you’re going to need to address the fear itself and come up with a way to help your dog through it. The fear isn’t going to get better by just ignoring it, and it can often get much worse. If you find yourself in a situation where both you & your dog are fearful the best solution may be to just walk away. If you can’t control what’s happening and you’re unable to turn the situation into a positive experience sometimes leaving is the best solution. It’s certainly not easy to do, and it can feel like a failure. But knowing when to say “this isn’t working” can help get you out of a situation before it incites even more fear. As with managing fear in any aspect of life it’s a judgment call, and there isn’t always going to be a simple solution. A common way to help fearful dogs is by using counter conditioning. It’s the process of changing a negative emotional response into a positive one, and it works well for many fears. It’s not a quick process, but to truly help with fear you should be trying to think of ways to help your dog start to see those scary things as not so scary after all. Another misconception I see regarding the idea of reinforcing fear by providing comfort is confusing fear with behaviors. We spoke about fear above (the emotional response of feeling like were in danger) and how providing comfort won’t make the fear itself worse. Now let’s move onto behaviors. Fearful dogs can exhibit a variety of different behaviors when they’re scared. They might exhibit the classical signs of fear such as pacing, shaking, whining and hiding. But scared dogs can also exhibit defensive behaviors such as growling or snapping. 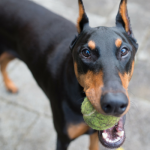 The best example of a fearful dog exhibiting defensive behaviors is resource guarding. It’s when a dog gets defensive when you approach their “stuff,” most often their food. Laika had severe resource guarding years ago, and I’ll be the first to admit I didn’t see it as a fear based behavior at all to begin with. I thought she was just being a selfish jerk. After much research & with the help of a trainer we started to address Laika’s resource guarding through counter conditioning & lots of patience. Dogs that guard their food aren’t being territorial or dominant. They see you as a threat to their stuff and they’re acting defensively out of fear. It’s important to understand that behaviors such as resource guarding are fear based, and not just the sign of an aggressive and/or selfish dog. In order to see long term results when managing issues such as resource guarding you need to address that fear and help them start to see you coming towards their food as no big deal. If you look up how to address resource guarding you’ll find two camps. Those who use counter conditioning, and those who challenge their their dogs head on to give up their stuff by being more dominant. Those who put emphasis on being dominant over fearful dogs can definitely reinforce those defensive behaviors, and they can make your dog see you as more of a threat. If you keep challenging a fearful dog you’re teaching them that there is indeed something to be scared of, and how they respond will vary. Some may shut down and some will choose to get even more defensive. Another example of how we can reinforce fearful behaviors is how we respond when our dog meets strangers. Your dog will still be scared of strangers because you haven’t helped address their fear, and since you comforted them while growling they may start to think of that behavior as acceptable. In other words nothing will change, and your dog will still be scared & probably growl the next time it happens. To help address my dogs fearfulness of strangers I like to make Laika’s associations with new people positive. I’ll give them treats to give her, or tell them to kneel down & let her come to them. Since she’s only slightly nervous around new people it’s pretty easy and after 30 seconds they’re usually her new best friend. With dogs with more severe fears you’re going to have to work on it. You’re going to need to find a method that helps your dog address their fear in a way they can manage, and one that will help them start to see that scary thing as no big deal. Training your dog to face fearful stuff can be tricky, and there’s not always one correct answer or method that will work for every dog. Teaching your dog to be less fearful of the garbage cans on your block is different than trying to manage their fear during fireworks. What’s important to remember is that if you want your dog to become desensitized to the fearful situation you need to keep it positive & non-threatening. Forcing a dog to just face his fears doesn’t work and will likely make it worse. We are our dogs whole life. We provide them with food, shelter & love. When your dog is fearful it’s up to you to provide them with the help & support they need to manage those fears. At some point we all need a little help to manage our fears. You know your dog best, and you know how to help soothe them during their fear. You can’t reinforcing fear by providing your dog with comfort. It’s a common misconception regarding fear in dogs & humans alike. Denying your dog comfort in a stressful situation can make their fears worse. I don’t think of helping my dog face her fears as comforting or coddling, I like to think of it as me coming up with ways to help lessen her fear to begin with. I’m not just comforting her because she’s scared, I’m comforting her because it’s often the best way to help her move forward and learn to face those fears on her own. Each of these articles goes into greater detail on the subject of comforting a fearful dog, some methods to use, and why it’s such a misunderstood topic. It’s OK to Comfort Your Dog! Can You Reward a Dog’s Fear? Do You Comfort Your Fearful Dog? When your dog is scared do you comfort them? Do you pet them during thunderstorms? Welcome to the Positive Pet Training Blog Hop hosted by Cascadian Nomads, Tenacious Little Terrier and Rubicon Days. Please share your responsible pet owner positive pet training tips by linking a blog post or leaving a comment below. The theme for this month is wildcard (whatever you want!) but any positive reinforcement training posts or comments are also always welcome. Great post. It hurts my heart when I hear the advice not to comfort a frightened dog because it will reinforce the fear. The difference between emotion and behavior is very important. Thank you, it is such an important distinction and unfortunately it seems like many fearful dogs don’t get the support they need because people are afraid of making it worse. This is a fantastic post. I used to panic and that would let my dogs know that their fear is justified. When I learned how to behave around my dogs, I noticed their fear decreased significantly. Rodrigo used to be very stressed with fireworks, now he isn’t a fan, but he’s fine as long as I’m fine. So I turn on a movie, and relax on the sofa with him until he falls asleep. Thanks. It seems to really come down to knowing our own dogs well enough to know what will help them in any given situation. Great ideas–especially on how we define comfort. Barley has a weird list of things that she fears; there are the normal things like thunder and fireworks, but she’s also scared of kites and birds to name a couple–each fear requires different types of comfort. She finds comfort in curling up in the bathroom, closet, or under the bed during storms or fireworks, so I’ll occasionally go check on her and give her a quick pet and maybe hide a few treats around the room for her to find if she starts feeling braver, but mostly I just leave her to herself and she comes out when she’s ready. For birds or kites, I comfort her by asking for behaviors that take her mind off of them, praising her, and doling out the treats. Great job with this post! Thank you. What it is about dogs being afraid of stuff in the sky? Laika has a fear of big flags, especially on windy days when they’re making more noise than usual. I don’t know that we’ve seen a kite, something makes me think those might make her nervous as well. I always do. And Mr. N knows we’re a source of comfort… during fireworks, he came into the bathroom and climbed into the bath with me. He dislikes getting wet but I guess fireworks are worse! Thanks for joining the hop. My post ended up pretty rambly, so I linked to this one for people to get actual information! As you know Sampson has just recently developed a fear of noises. If he feels better with me holding his head in my hand, of course I will do that. I’ve never understood the people who suggested they should be forced to deal with their fears, first it seems inhumane to me and second, how would that help? I’m afraid of spiders, I don’t want someone forcing me to hold one! Bravo, Jen! You explained this so well by making the distinction about how we define comfort. I like what you mentioned the info in the section “A Quick Note About Remaining Calm” because I think a lot of dogs are very reactive to our own emotions and fears. I had a friend who was so anxious when her dog would become scared about loud noises, I think they fed off of each other’s fear and nervousness, even though she would try to comfort him. When she relaxed and acted normal, it really helped her dog relax as well. Such an interesting topic and great points here! This is SUPER thorough and such a great resource to share. It makes me sad when I hear people say that they won’t give their dog comfort when the dog is scared. I know when I’m scared it certainly helps to have someone comfort me, so it makes sense it would help my guys, too! The one thing that really struck me, though, was your point about reinforcing a fear by avoiding it… I was guilty of this with Cooper and his stranger danger. When we’re out for a walk and I either run out of treats too soon or we’re in a hurry or something, I find myself crossing the street when I see someone rather than taking the time to work with him. Until I pinpointed what was going on, I couldn’t figure out why it seemed his fears were escalating until I realized… because I’m leading him to believe stranger=run the other way! Crud. Just a good reminder that we’re BOTH always a work in progress! Thank you, and yes it is so heartbreaking that many of us have the mentality that giving comfort to a scared dog is a bad thing. And as to your comment about both being a work in progress I couldn’t agree more; I often think I’m the one who needs a lot more training.